It will give a good indication as to just how serious the government is about reining in debt. Ratings agencies have indicated that without a commitment to reducing debt South Africa’s national debt could attract junk status. There was also plenty of interest in how the Minister planned to increase taxes, which he signalled would happen in his October Medium Term Budget speech. Personal income tax increases by 1% as the maximum rate rises to 41%. As many had expected this to rise to 45%, this has been generally well received. 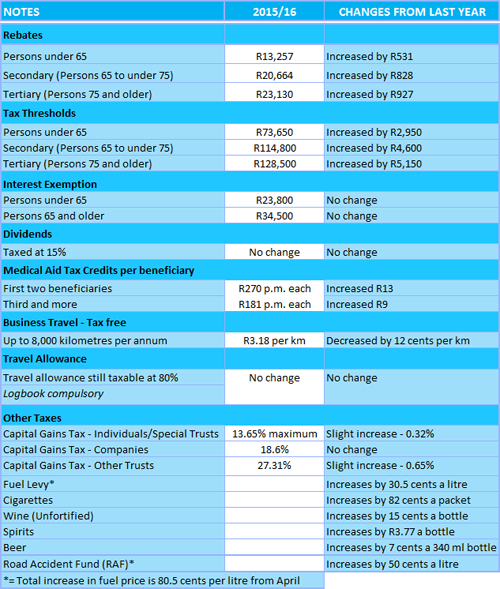 The increase does not affect taxpayers with taxable income of R181,900 or less. Over that, at R200,000 taxable income for example the increase is R21 per month rising to R1,105 per month for taxpayers with taxable income greater than R1,1 million. Taxpayers with incomes of less than R450,000 will be better off whilst those with incomes above this threshold will face higher taxes. This is due to inflation adjusted increases for tax brackets, the tax rebate and the medical rebate. The bad news is the price of fuel will increase by 80.5 cents a litre from April. This consists of fuel levy (30.5 cents) and Road Accident Fund (50 cents). Effectively, a large chunk of the fuel savings we have had in recent months will be taken away. Sin taxes all go up as expected – see the table. There is a sharp drop in the Micro Businesses Turnover Tax with the maximum rate falling from 6% to 3%. This is a significant concession to small business. Transfer duty on properties that sell for less than R750,000 has been abolished and will reduce for properties that sell for up to R2,3 million. Above the R2,3 million threshold, transfer duties will rise. The foreign exchange allowance for residents has been increased from R4 million annually to R10 million per annum. Families wishing to emigrate may take out R20 million (previously R8 million). This is another important relaxation of exchange control. The country will enjoy twelve months of reduced Unemployment Insurance Fund (UIF) contributions. The maximum contribution will drop to R10 per individual. This will put R15 billion back into the economy. The government will increase the electricity levy until carbon tax is implemented in the 2017 year. Proposals for pension reform will be released for public comment later this year. National Health Insurance has been agreed to but it has been deferred to another year. These increases in income tax and fuel levy will add R16.8 billion to tax revenues. Expenditure cuts of R25 billion will be made over the next two years. In addition, there is a significant increase in capital expenditure which will underpin future economic growth. Economic growth for 2015 will be 2%. This is a reduction from previous forecasts and reflects the energy crisis and uneven global growth. As population growth is 1.2%, this does reflect real growth of 0.8% for the country. The budget deficit to GDP (gross domestic product) ratio is 3.9%. In recent years it has been 4.1% so this should give comfort to the rating agencies. The fact that the currency and bond yields did not move during the Minister’s speech indicates that markets were satisfied with the budget. Inflation is forecast to fall to 4.3% this year and rise up towards 6% in the following two years. This decrease will encourage consumer spending. The budget has endorsed recommendations from the Davis Tax Committee - the drop in tax rates for micro businesses being a case in point. Recommendations to avoid base erosion and profit shifting will also be implemented – this is to counteract companies artificially shifting profits to tax havens. No mention was made of privatisation and there were no specifics on selling non-core assets to fund State Owned Enterprises such as Eskom and SAA. The Minister also stated that government is committed to tolls as a means of paying for the improvement and maintenance of roads. The consensus is that the Minister has delivered a credible budget in difficult circumstances. There are significant risks that can derail the successful implementation of the budget. Salary increase negotiations for civil servants have begun with unions wanting a 15% pay hike and the government providing for a 7% increase. If economic growth falters, this will put pressure on tax collections – for the first time in many years, tax revenue fell short of budget in the current fiscal year. The Treasury department has been encouraging individuals to save more for several years and is following up on this by launching tax free savings accounts (TFSAs) on 1 March this year. It is for individuals and allows them to invest R30,000 per annum until a threshold of R500,000 is reached. Thus a couple will be able to invest up to R 1 million but it will take more than 18 years to get to this limit. Parents can it seems also invest in TFSAs for their children – a family with three children could save R150,000 per annum per family. The advantage of this is all income received is tax free. This includes dividends (where 15% withholding tax is normally deducted), interest and capital gains. There will be no restrictions on withdrawals from this fund as opposed to retirement funding and it would seem that one of the rationales for TFSAs is that individuals needing to access money will draw on their TFSA and leave their retirement funding intact. The penalties for withdrawal will be kept low and withdrawals are to be paid out within seven to thirty two business days depending on the type of investment. It will not be possible to transfer existing investments into TFSAs as the intention of this measure is to encourage new savings. From 1 March 2016, individuals will be allowed to move existing TFSAs to other TFSAs. Who can issue TFSAs and what type of investments can be used in TFSAs? Banks, long term insurers, managers of collective investments schemes/unit trusts, government, mutual banks and co-operative banks may set up TFSAs. The net for investments is fairly wide and you may use unit trusts, endowments, fixed deposits, bonds and certain exchange traded funds. Treasury want to see simplicity, transparency and suitability in the products allowed. Funds that charge performance fees are excluded from participating in TFSAs and fees charged are to be reasonable. Failure to comply with the regulations will result in the TFSA losing its tax free status. What do the returns look like? Projections done by investment analysts show that TFSAs should produce returns slightly more favourable than retirement saving products. For investors who only want interest bearing products, the return should be nearly double that of similar non TFSA products due to the tax saving. Over the next few months most financial institutions will be launching TFSAs. This promises to be an attractive product for serious long term investors. Certain Small and Medium-Sized Enterprises were given until the end of 2015 to submit a PAIA manual in terms of the Promotion of Access to Information Act. This is a reminder not to forget to submit the manual to the South African Human Rights Commission. As this is a relatively simple process, there is a small cost of compliance for business. Businesses that were exempted until 31 December 2015 are those with less than fifty employees or turnovers lower than prescribed. These turnovers vary from R25 million per annum for wholesale and retail traders to R2 million for farming operations. There has been a considerable media spotlight on government’s intention to reform retirement funding. This has now been postponed as there is no agreement on proposals. It is worth taking advice on maximising your contributions in the meantime. The thrust of government’s approach is to limit the taxable amount of contributions that can be made to retirement funding which will effectively penalise high net worth individuals. We have warned before on the continuing rise in cyber crime (see for example November 2014’s CA(SA)DotNews) and it is now taking on a particularly sinister turn. Recent media reports refer to organised crime syndicates hijacking companies’ databases and demanding ransom for the return of the database. This happened for example at Target, one of the United States’ largest retailers, last year. Experts have no doubt that this has already begun happening in South Africa, so be proactive and ensure your systems are as robust as possible. Class action suits are seen as a way to give poorer communities access to justice by making it relatively easy and cost effective to sue large companies and government. The United States makes extensive use of class action suits. Here in South Africa, the Legal Resources Centre recently won a R82 million class action suit against the Eastern Cape Department of Education. Previous attempts to begin “opt-in” class action suits in South Africa foundered before the courts; mainly over defining who exactly the class consists of – i.e. who are the litigants. The LRC were successful as they carefully defined who the “class” were. This precedent will make it easier for future class action suits.